We've all had times when unwanted thoughts just won't go away, but keep returning, as if they were a hamster on a wheel. This state interferes with work, with pleasure, and with sleep. Generally, the thoughts are of a worrisome experience or problem. We lay awake, replaying an event in our minds, imagining that we had said the "right" thing instead of whatever we did say. This is the negative White Chestnut state – when the personality has turned its back on guidance from the Higher Self. Of course, the problems never seem to get solved, because thoughts are too jumbled to allow for a solution. Chronic sufferers often exhibit a pinched, unhappy face and complain of a chronic frontal headache. And of course they suffer from fatigue, since sleep eludes them. 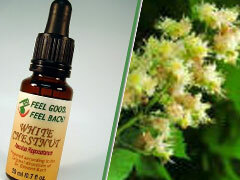 The Bach Flower Essence White chestnut can help alleviate this state, and bring the sufferer back to a balanced, calm, peaceful and problem solving state of mind. If you're losing sleep because your mind won't stop replaying an unpleasant event, come to FeelBach! and order your bottle of White Chestnut. Are You Trying to be a Saint?